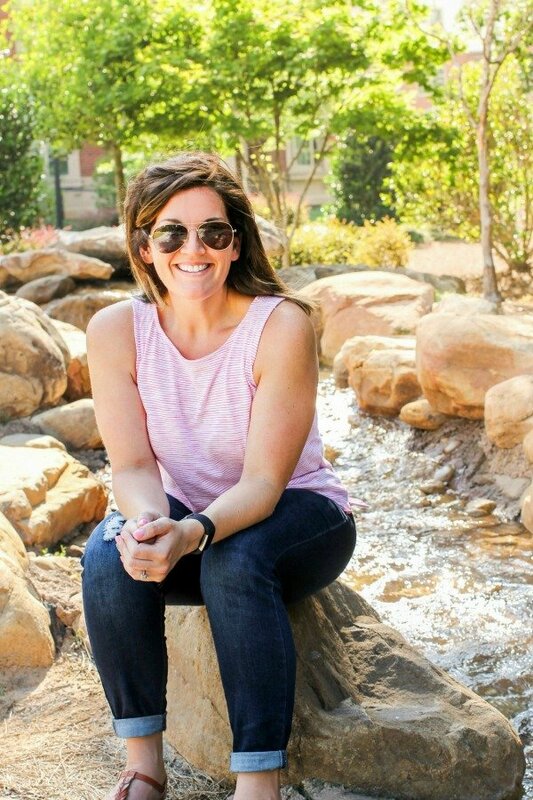 September 17, 2018 By Allyson 21 Comments This post may contain affiliate links. Read my disclosure policy. 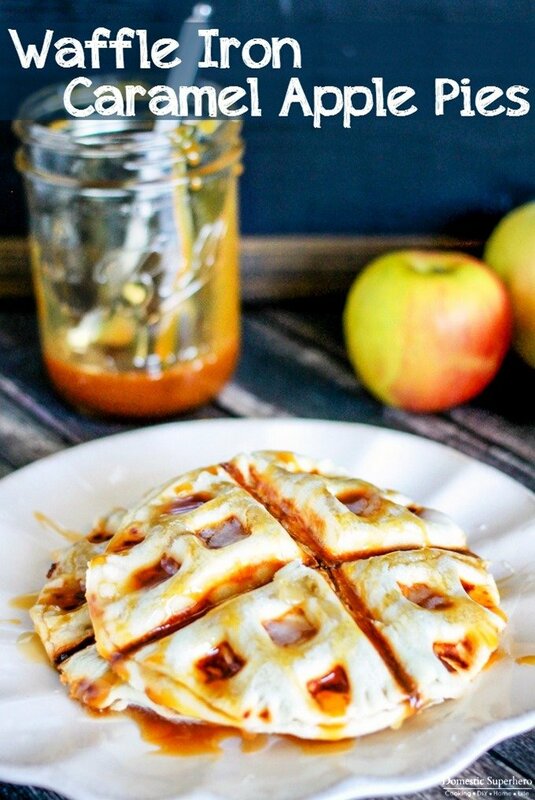 Waffle Iron Caramel Apple Pies are full of apples and caramel sandwiched between a flakey pie crust! Best of all, you can make this pie in 10 minutes! It’s fall y’all!! Yay!!!! Now, of course that means nothing in Georgia, because it was still 92 degrees today, BUT, I will make all things apple and pumpkin going forward, and it will be glorious!!!! Glorious I tell you! Speaking of apples…you aren’t going to believe this recipe, because it’s INSANE!!! Literal insanity on a plate. Can you tell I am a little excited?! Waffle Iron Caramel Apple Pies are the best creation since sliced bread. With only a handful of ingredients and taking only a few minutes to make, you are going to LOVE this fall treat! By using a Waffle Iron, apple pie is available all the time! In about 10 minutes from start to finish, including gathering up all the ingredients, this delicious fall treat is ready to eat! It’s SO easy! This recipe uses pre-made pie crust which is a great shortcut in my opinion, but of course you are welcome to use your favorite pie crust recipe and make it homemade as well. I like to call this a lazy-baker recipe because I use canned apple pie filling, pre-made pie crust, and jar of caramel sauce (although I like my homemade caramel as well)…it works PERFECTLY. The only thing you actually have to ‘make’ is the glaze, which is just powdered sugar and milk mixed together! Take the pre-made pie crust, roll it out, and cut it into circles (use a small bowl or a cup), then add a little pie filling to the middle, and pinch/fork the edges closed. Toss this bad boy into your waffle iron and cook it for about 5 minutes. Now, my iron was telling me it was done, but it wasn’t, so you might have to open it a few times to check to see if it’s done, but you want to make sure the dough is cooked. This took about 5 minutes. Then, whip up the glaze and drizzle over the top. Drizzle the caramel on top, too! BOOM DONE! These are the perfect cute desserts for fall. You can easily made several of these and serve them at a party or for dessert! I was able to make 2 from each sheet of pie crust (most boxes have 2 sheets, so you should be able to make 4 with one box), but it also depends on the size of the bowl you use to cut your circles. Want to see exactly how I made these waffle iron caramel apple pies, step by step? Check out the video below! Caramel Apple Poke Cake is packed with apples and then smothered in whipped cream and caramel. It’s the easiest most delicious fall cake! Apple Raisin Cinnamon Rolls are filled with tart apples and sweet raisins, combining the delicious flavors in the perfect breakfast treat. Caramel Apple Monkey Bread is loaded with caramel, apples, and delicious brown sugar; Serve it up for breakfast or dessert! 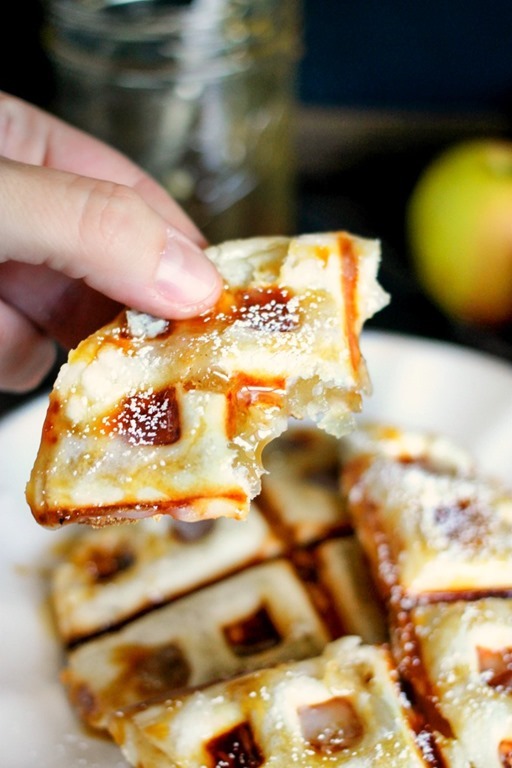 Waffle Iron Caramel Apple Pies - only 10 minutes start to finish for these amazing hand pies! Heat a belgian waffle iron, set aside. Using a small bowl (about 4 inches across the top), cut out 4 circles from each crust (8 total) Place about 2 TBS apple filling in the center of 4 circles. Place remaining dough circles over the top of the apple filling. Using your fingers, pinch the outside close, then use a fork to really secure the outside shut (you don't want a waffle iron full of apple filling!). One at a time, cook each pie in the waffle iron. Check for done-ness - the dough needs to be cooked (it took me about 5 minutes per pie). Remove from iron and repeat with remaining pies. In a small bowl mix the powdered sugar and milk until completely combined. Add more milk if you need to thin the glaze, but careful not to add too much as you want it a little thick. Serve each pie with glaze and caramel drizzled over the tops. Serve warm! 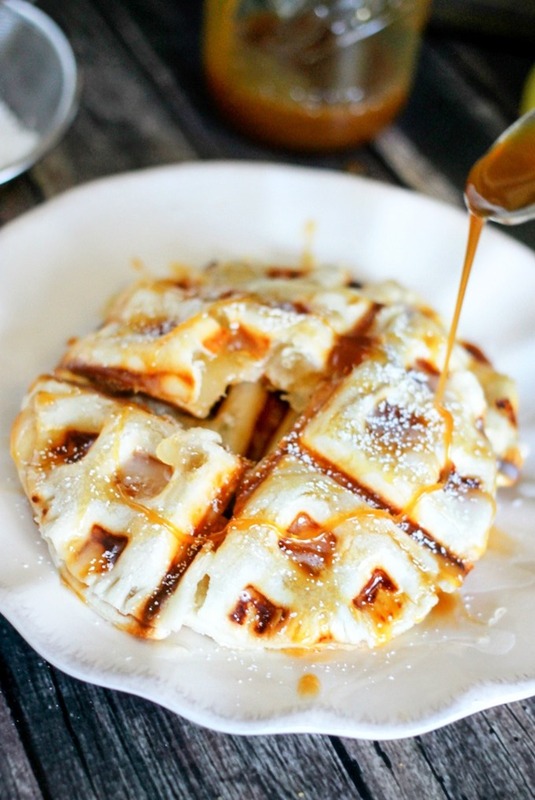 I don’t use my waffle iron nearly enough… gonna have to bust it out and try these!!! I LOVE this!! I think I have all of these things in my pantry. Yay! 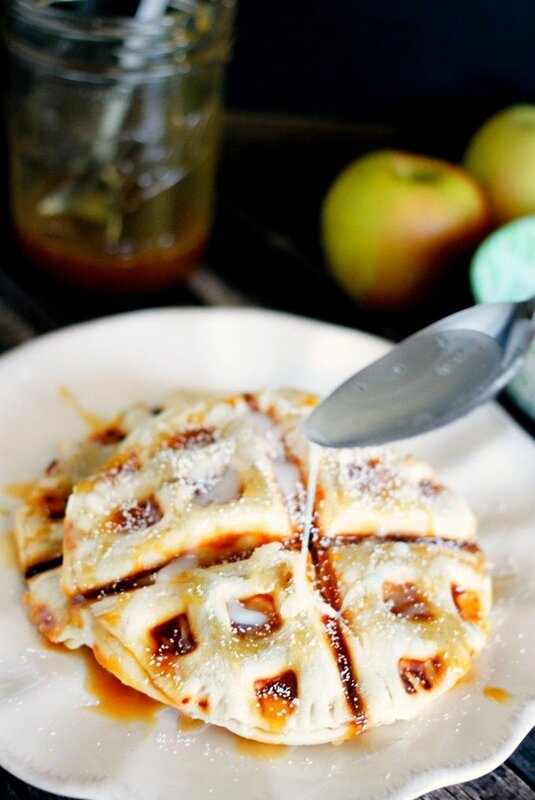 I’m pulling out my waffle iron and making these! They look so good! Hey Allyson …! this is one of my favorite recipe and your waffle iron caramel apple pies looks so yummy and delicious. i will tried to make it, Thank so much for fabulous recipe….! Hi Sam – I hope you like it as much as I do! I pinned these earlier today! I’m totally craving caramel apple waffle pies now! I love this idea! I will be using it for sure! This sounds like a perfectly sticky, caramely, delicious dessert! Can’t wait to bust out the waffle iron and try it! OMGGGGGG you just made apple pie wayyyyy too easy 😉 These are gonna be a new fav in my house! This is such a fun idea! Great for kiddos parties this fall! Great idea! Looks so delicious! This is a fun idea! I have two waffle makers I rarely use because I’m not a morning person lol! But I am a dessert person! Um yes please! What a creative way to use my waffle iron! What a creative and delicious idea! These are a great fall dessert! These look so tasty! I’ll have to try these! Yum! Can I have these pies for breakfast tomorrow? Look so so inviting! Anything that resembles a waffle is fair game for breakfast in my book! What a clever idea, those look so fun and tasty! What a great idea! I love the flavor of these! What a great way to start the day! These are mouth watering!